Original, quality late 19th century sycamore butter print with a circular front with good carved detail of an abstract of three leaves and three flower heads. A couple of minor old worm holes now well treated, cleaned and waxed and complete and in good and working order. Face 3.25" diam and total 2.75" tall. 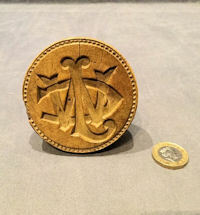 Original, quality late 19th century sycamore butter print with a circular front detailing well carved three overlapping initials "W.J&C" in 'Gothic' style type with a beaded border. Old worm holes now well treated, cleaned and waxed and complete and in good and working order. Face 3" diam and total 2.75" tall. 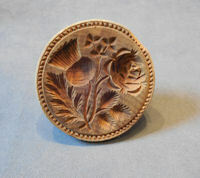 Original, quality late 19th century sycamore butter print with a circular front deeply carved with good detail of a rose, a thistle and shamrocks, representing England, Scotland and Ireland. Old worm holes now well treated, cleaned and waxed and complete and in good and working order. Face 3.25" diam and total 2.25" tall. 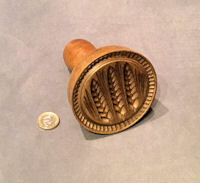 Original, quality circa 1900, small butter stamp turned in sycamore with the carved detail of an acorn with oak leaves. Complete and in good order. 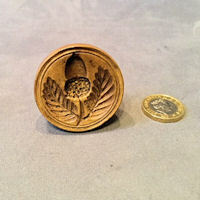 1.75" tall and 1.75" widest diam. Original, quality late 19th century butter stamp carved in sycamore with a replacement handle in beech copied from an original. The design to the stamp details three vertical ears of wheat within a chip carved border. Complete and in superb order. 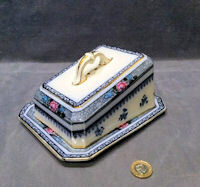 Stamp 3.75" diam and total 5" tall. 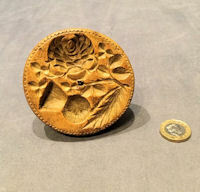 Original, quality, late 19th century, sycamore butter stamp with good carved detail of a thistle, a rose and a shamrock, representing the union between Scotland, England and Ireland".Complete and in good order, with no worm damage, but a mouse has gnawed at one edge. 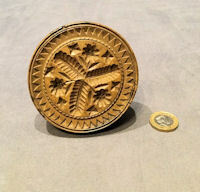 3.5" diameter x 2.25" tall. Original, quality late 19th century oval shaped tinsmith made steel dairy can as used on milk prams and floats when delivering door to door. 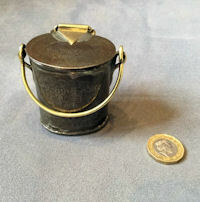 This tiny example has the standard brass wire swing out handle and a brass loop and mout to the hinge of the lid stamped to the top "S. Taylor" and to the front "Manor Farm Dairy. E Molesay, London". All has been cleaned, polished and lacquered and is complete and in good and working order. 2.75" with handle down x 2.75" wide and 2.25" front to back. 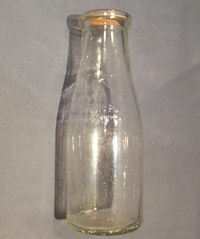 Original, quality post-war, one pint capacity clear glass milk bottle with an old card push in cover. The bottle is embossed "This bottle is the property of SCWS, loaned on deposit" and the card cover "Drink more milk enjoy good health". Very clean with no chips or blemishes and complete. 8.5" tall and 3" widest. 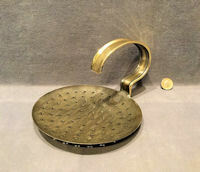 Original, quality late 19th century circular pierced steel milk skimmer with a curved over brass handgrip. This example has wrap over edges on the brass handle and all has been polished and lacquered, although the lacquer may be removed at no extra cost. Complete and in good order. Skimmer 6.75" diam and total 9" x 6.75" x 4.5" tall. Price is for each. 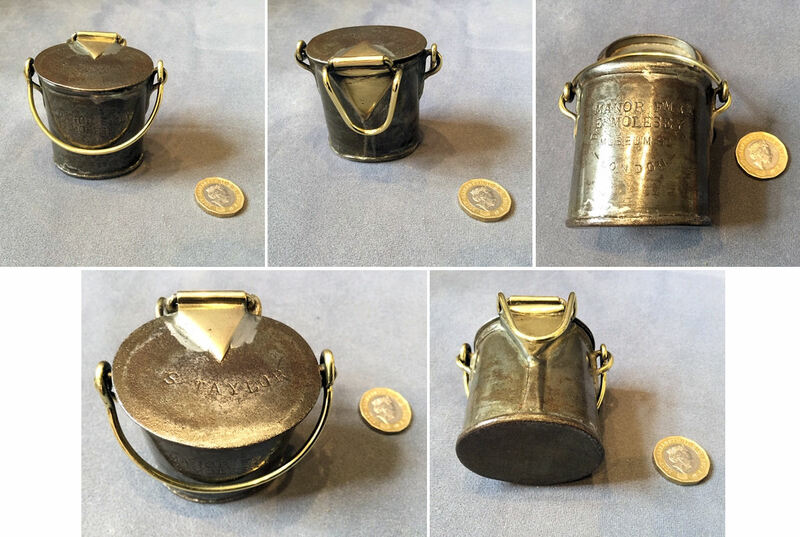 Original quality, late 19th century, oval steel dairy can as used on milk delivery prams and floats when delivering from door to door, straight from the churn. 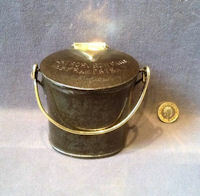 This example has the standard brass wire loop swing handle to the top, a fixed loop to the back and large brass mounts to the hinge of the lid. All has been cleaned and lacquered and is complete and in good order. 5" tall, 4.5" wide and 2.75" front to back. Original, quality 1920's half gill steel dairy measure with a brass handle. 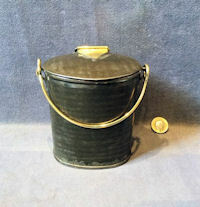 This example has a tapered bowl, stamped "Half Gill", a lead custom's stamp and a sheet brass loop handle with rolled over edges. Cleaned and lacquered and complete and in good and working order. 4.5" tall x 2" widest and 4" front to back including handles. 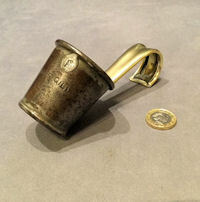 Original, quality 1920's 'Gill' steel dairy measure with a brass handle. This example has a lead customs stamp and a brass label punched "Gill" for the capacity and a short sheet brass loop handle with rolled over edges. Cleaned and lacquered and complete and in good order. 4" tall, 2.25" wide and 3.5" front to back. 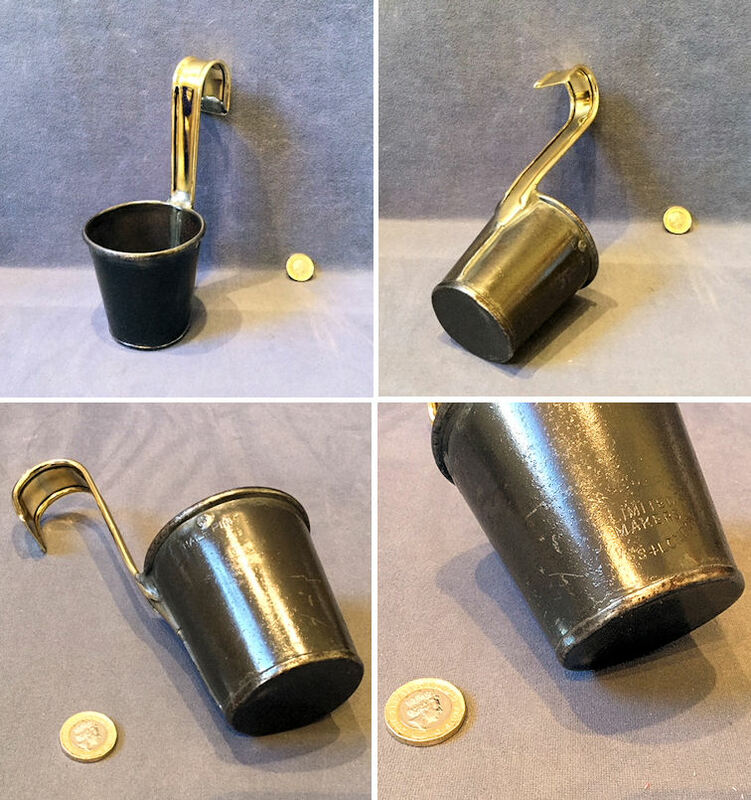 Original, quality 1920's half pint steel dairy measure with a brass handle. This super example has a tapered bowl, stamped "half pint", a lead customs stamp and a sheet brass loop handle with rolled over edges. 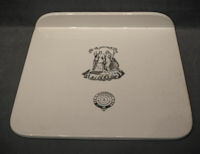 The front of the measure is impressed for the maker "Dairy Supply Co' Kings Cross London". Cleaned and lacquered and complete and in good order. 7.5" tall, 3.25" widest and 5.5" front to back. Original, quality 1920's oval shaped steel dairy can, as used on milk delivery prams and floats when delivering door to door, straight from the churn. This example has the standard brass wire swing handle to the top, a fixed loop to the reverse and a large brass mount to the hinge of the lid. 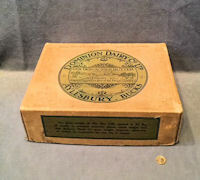 The top is stamped "North Church Farm Berkhamstead" and the front is stamped for the manufacturer "Dairy Supply Company. Museum St. London". Cleaned and lacquered and complete and in good and working order. 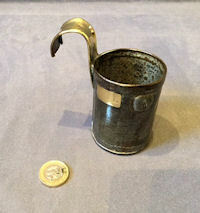 3.75" tall with handle down, 4" wide and 3" front to back. Original, quality 1920's oval shaped steel dairy can, as used on milk delivery prams and floats when delivering door to door straight from the churn. This example has the standard brass wire swing handle to the top, a fixed loop to the reverse and a large brass mount to the hinge of the lid stamped. 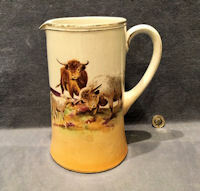 "The Standard Milk Can". The front of the can is impressed "6 Wardo Avenue Fulham". Cleaned and lacquered and complete and in good order. 4.75" tall and 4" x 3". Original, quality, post-war, one pint capacity glass milk bottle with embossed details of the supplier of the milk "Griffiths and Bro', 51 Chalcot Road, Regents Park NW1" and with an old cardboard push in top detailing "Pure Milk". Some chips to the base otherwise complete and in good order. 8.5" tall x 3" base diameter. 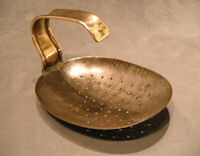 Original, quality, oval shaped, pierced steel milk skimmer, with a brass curved over handgrip. 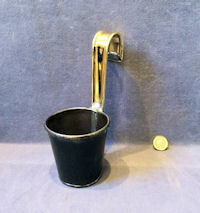 This most unusual shaped skimmer has a wrap over edged sheet brass handle and has been cleaned and lacquered, althought the lacquer may be removed at no extra cost, all is complete and in good order. Pan 6.5" x 5" and 0.75" total. 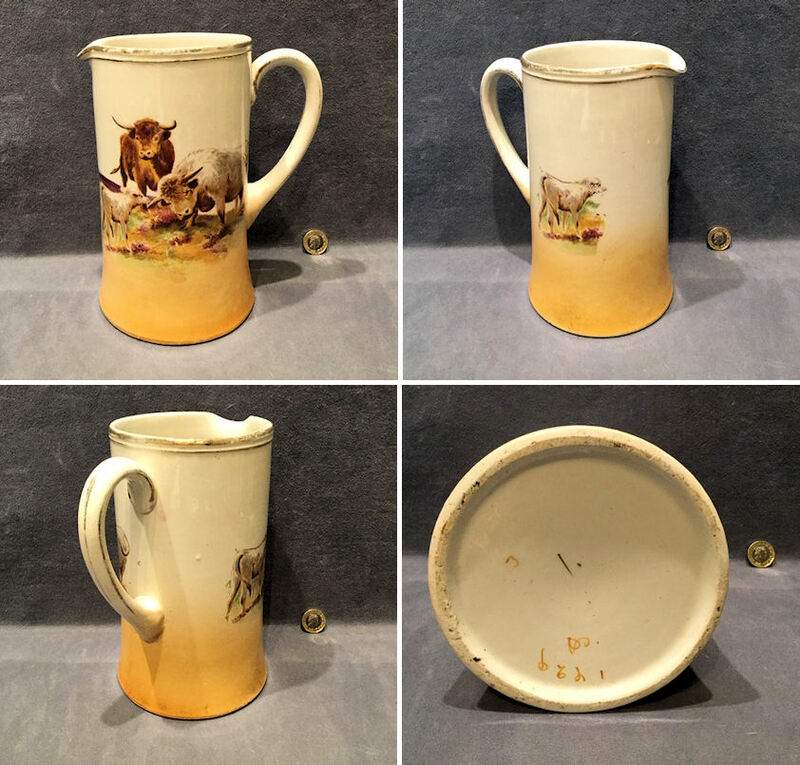 Original, quality, post war, one pint capacity, glass milk bottle detailed to the front 'Briar Farm Dairy, G. H. W. Shuter 23 Tennyson Rd Luton, phone 1797'. One chip to the top rim, otherwise in good order. 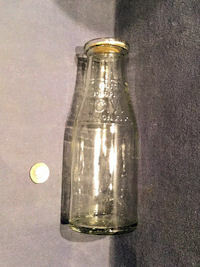 This size milk bottle originally had a push in cardboard cap. 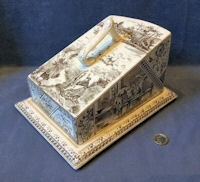 8.5" tall, base 3" and top 2 1/8" external. Original, quality, milkmaid's dairy yoke, circa 1900, complete with the original hooks and chains. This yoke, in beech, has a few worm holes, but has been well treated and the chains cleaned and lacquered. Part way down the chains are the adjustment hooks to ensure the length is correct for carrying the milk buckets, for ideally, the dairy maid would be holding the milk pails at a level for the yoke to take a share of the weight. A super clean yoke and chain, complete and in good and working order. Yoke 36" x 7" x 2.5" and hooks and chains 35" x 2". 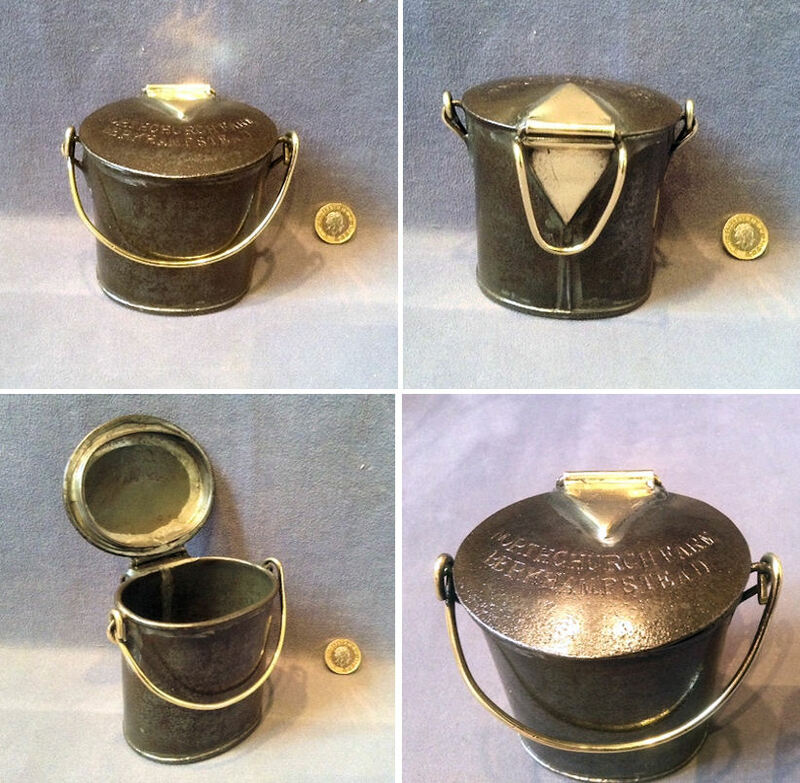 Original quality, late 19th century, oval steel dairy can as used on milk delivery prams and floats when delivering from door to door, straight from the churn. 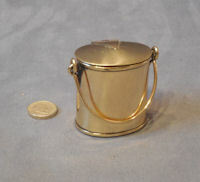 This example has the standard brass wire loop swing handle to the top, a fixed loop to the back and large brass mounts to the hinge of the lid. All has been cleaned and lacquered and is complete and in good order. Base 4" x 3" and total 4.5" tall with handle down. 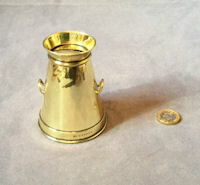 Original, quality 1920's pressed brass money box in the form of a good scaled down, 17 gallon milk churn with a tapered body, a coin slot to the top and a pull off lid to the underside. The lower rim is stamped with the registration number for the year 1923. Polished and lacquered, although the lacquer may be removed at no extra cost and complete and in good and working order. 3.5" tall and base 2.75". 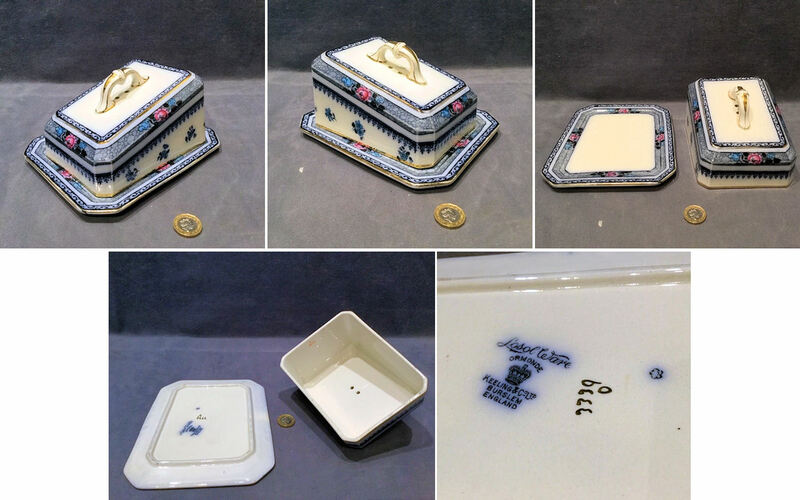 Original, quality late 19th century 'Cottage Loaf' shaped white ceramic grocers' / butchers' 4oz shop counter weight, transfer printed to the top "Imperial 4oz". A very desirable weight in perfect condition. 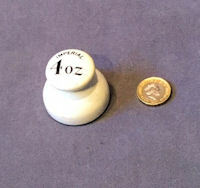 One imagines these ceramic weights had a short life due to being prone to damage. 1.5" tall and 1.75" base diam. 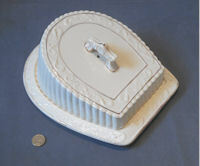 Original, quality late 19th century 'Cottage Loaf' shaped white ceramic grocers' / butchers' 4lb shop counter weight. Despite its overall scruffy condition this weight is complete bar the chips and is still very desirable and hard to find. One imagines these ceramic weights had a short life due to being prone to damage. 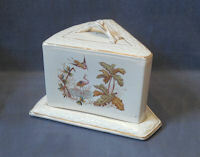 This example is transfer printed to the top "Imperial Enamel Weight 4lb". It has a hairline diagonal crack, lots of knocks and stains but is near complete and has retained the lead infill. 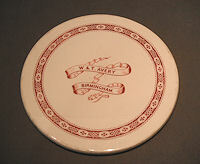 The underside is also impressed for the manufacturer 'Wedgwood'. 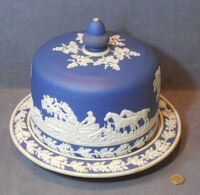 4" tall and 4.25" base diam.